The government’s plans for a revised “fair funding” formula would mean most grammar schools were worse off as a result of the changes proposed by the education secretary, Justine Greening – at a time when the government is banking on grammar school expansion as a key domestic policy aim. The Grammar School Heads’ Association said more than 100 of the existing 163 grammar schools in England would be worse off as a result of the proposals, with more than 60 suffering deep cuts in annual budgets. The new “fair funding” formula unveiled by Greening at the end of last year would impose cuts on schools in mainly urban and suburban areas, and redistribute funding to more rural regions that have received considerably lower per pupil funding for many years. However, the policy failed to inject any new funds into the school system, meaning that thousands of schools in England with frozen budgets will be further disadvantaged. 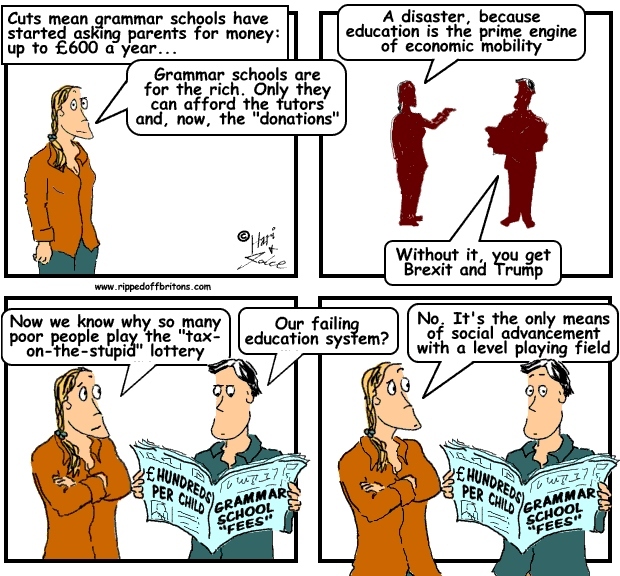 Grammar schools, which select by academic ability at the age of 11, are worse off than many state schools because of their failure to admit disadvantaged pupils eligible for additional government funding of more than £900 each a year. Altrincham Grammar School for Boys has just 26 students receiving pupil premium funding out of 1,250 students enrolled, or just 2% overall. Schools in England are not allowed to charge pupils for teaching, attending or applying to join a school. But they are allowed to approach parents for donations and to charge for additional activities such as trips. While some grammar schools already ask parents for regular donations, Tim Gartside, the headteacher of Altrincham Grammar School for Boys in Trafford, said his school was considering asking parents for donations of £30 to £40 a month if the new formula goes ahead. Parents of pupils at Latymer school, a grammar school in north London, were told last year that a “very significant financial shortfall” could force it to cut staff, increase class sizes and offer fewer subjects at GCSE and A-level. A letter from the school’s headteacher and governors asked for donations of £30 to £50 a month, and told parents such contributions were “considerably less than the average fees of an independent school”. Other grammar schools known to have asked parents for donations include Southend High School and Ilkley Grammar School. Official stats show Free Schools are no better, but they are cheaper to "build" from ex-office space! Nice article i would like to share it with https://typicalstudent.org/ team.